Frenchmans Quarter Horses is the home of the maternal line that produced Bozo and Frenchmans Guy! From one great mare, Caseys Ladylove, began the foundation that produced legendary performance horses on the track, in the arena, and futurity pen. Caseys Ladylove is the dam of the great mares Caseys Charm, dam of French Flash Hawk "Bozo" by Sun Frost, and Frenchmans Lady, the dam of $9 million sire Frenchmans Guy! The late Frances Loisseau, the well known and much loved matriarch of Frenchmans Quarter Horses, described what constitutes a truly great horse: "It takes ability and opportunity for a great horse to be recognized." 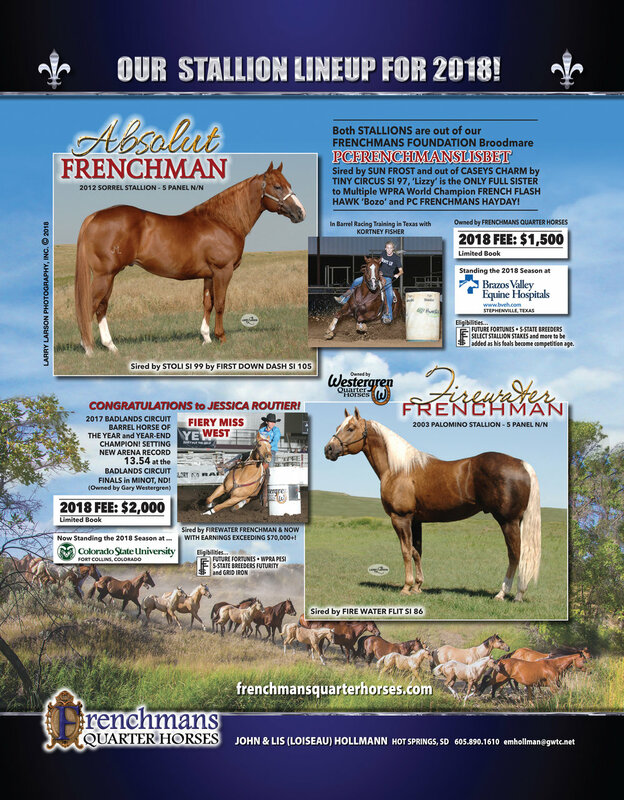 Today, Frenchmans Quarter Horses is managed by John and Lis Hollmann (Frances' daughter) near Hot Springs, SD. John and Lis are proud to continue the legacy and carry on the tradition of the proven bloodlines of Frenchmans Quarter Horses. Absolut Frenchman and Firewater Frenchman will stand for LIMITED BOOKING to the public for 2018!